MUMBAI: Punjabi Music is ruling the Indian music industry currently with hits one after the other. Now the music has also made its way into live gigs and music festivals. Yes, we are talking about the biggest successful Punjabi Music Festival that wrapped up with the never-ending round of applause and shoutouts. 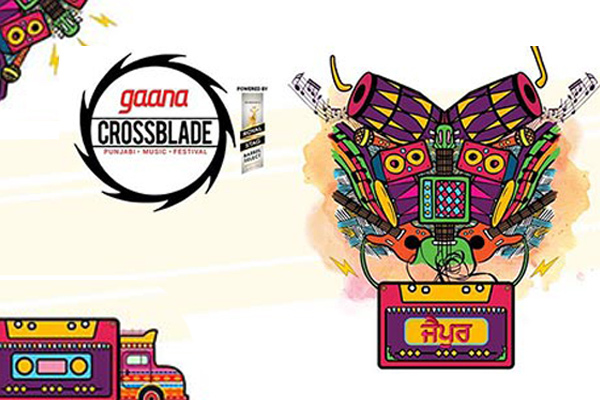 The two day Gaana Crossblade Music Festival ended its second edition in Jaipur last weekend. Located in the outskirts of the main city, in Sitapura, the event was held at JECC College. With an interesting line-up of Punjabi artists spread all over two stages, the city known as the second highest Punjabi music consumption was a lit. The festival also tried giving a pinch of electronic music by having Nucleya as the headliner for Day 1. Majorly attracting audience from teenage to the mid-30, the event also witnessed families with school going kids and adorable toddlers on Day 2. Undoubtedly every person present at the venue, be it a kid or grandparent, was enjoying the event. The two stages, RSBS and Gaana that were located at two different corners of the venue only saw audience running from one stage to another which kind of got messy. As per the schedule, the audience started walking in an hour or two prior which avoided hustle at the box office and entry. With a sweet and simple entrance, the venue had at least 8-10 photo stops which were mainly seen occupied. The security was strong enough for people creating chaos near the VIP lounge and Artiste lounge. Let us not get into the sanitation part because here the situation was same as all concert venues. If it is a music festival where the audience is expected to spend at least 4-5 hours, the food has to be great for them to be energised. It was disappointing to see very fewer food options in which non-vegetarian items ruled the menu. Both the stages were filled with halogen lights only that went across audience in different colours at various intervals. As each act ended, all the pure white halogens lit up, which were not eye pleasing. All excited teens started entering the venue with friends and special one's. The show began on-time starting with Stanley Live at the Gaana stage. Then it went on to Amit Gupta and Akhil Sachdeva on RSBS and Gaana stage respectively, which did not get a response as expected. Akhil Sachdeva, known as the Nasha Boy buzzed high expectations among the audience. The singer got on stage with an injured left hand and tried his best to engage the audience but unfortunately, his performance went way too flat. Soon after him was B Praak on the RSBS stage, the one who has given soul to Punjabi music banged on the stage Mann Bharaya. He performed all his hits and engaged with the audience for around 35 minutes, which was definitely not enough. Followed by him was Jasmine Sandlas on the same stage for around 40 minutes. The crowd then rushed to the Gaana stage where Mankirt Aulakh began entertaining the audience for another 45 minutes. As the following act was by Nucleya, people desperately waited to see the DJ on stage. There was a gap of at least 15 minutes after Aulakh got off stage and Nucleya to come in. After a long wait, the DJ started his power packed music with Laung Gwaha and the audience gathered around the Gaana Stage. Right from the stage barricaders to the food stall, each eye was towards Nucleya. Day 1 ended with loads of jumping and dancing. The next day got even more exciting as the line-up was pure Punjabi with artists like Manj Musik, Gurnazar, Yuvraj Hans, Parmish Verma and headliner Guru Randhawa. The day began with Roop Sindhu and Dolly Sindhu at RSBS stage followed by The Kutle Khan which was a Punjabi and Rajasthani jugalbandi. Gurzanar and Yuvraj Hans also saw some good amount of cheering ups. The audience then started filling the space at the Gaana Stage when Shirley Setia ran up to the stage with the authentic Rajasthani pagdi. Though Shirley has some great fan followings, but she is just not meant for a live performance. Every song she began went flat. All thanks to her band that helped coping up her damage. Before signing off the stage, Shirley and Gurnazar announced the date of their first collaboration Punjabi single that is set to release on 4 April. As soon as Shirley ended, the crowd rushed towards the RSBS stage for Manj Musik. He raised the energy to a next level. While performing a few songs with his band, the singer also gave loads of respect to the upcoming act, the headliner of the day, Guru Randhawa. Interestingly, 20 per cent of the crowd did not move from the Gaana stage, where Guru was about to perform because obviously who does not wish to see Guru as much closer as possible. After Shirley got done with her act, there was around 1 hour time gap for Guru to perform but the audience waited patiently. Finally, the headliners walked up the stage in style and owned it. Randhawa has some crazy amount of fans and Crossblade was testimony of this fact. He began with hits like High Rated, Lahore, Suit Suit and more. Along with the performance he kept engaging with his fans, repeatedly acknowledging them about the fact of life. He said, "You find love and also go through heart-breaks, these are a part of life. But never forget to respect and love your parents. Today you are here at the venue listening to me only because of them. So, remember to work hard and give them all the happiness and respect they deserve." The audience that waited to only one glimpse of the singer did not let its energy down even for a second until he was off stage. With all the heat, sweat the fans kept jumping and dancing like there was no tomorrow. Last but not the least came Parmish Verma. This act was more of interaction and less of singing, though he did not perform anything live. The man is a huge face in the Punjabi industry. The audience went so crazy to see him on stage that a section around the stage witnessed stamped. Luckily everything was back in control. On a concluding note, the event was well arranged. The two stage concept got a bit chaotic because the fans just rushed from one stage to another. This could have led to injuries given their enthusiasm. Well, Jaipur being the second largest consumer of Punjabi music, as per the organisers, turned out to be a success. The 2019 edition will have more than two cities, with an objective of reaching every Punjabi music fan in this country. NEW DELHI: It’s December, and the woollens have come out in Delhi. You can feel the chill even when the sun is high up in the sky overhead. The cold gets under your skin as the golden orb disappears in the distance, and you shiver. MUMBAI: The buzz had been building up for months now. Justin Bieber was coming to town. And one could feel the excitement in the air as the media went agog about his impossible demands to perform on his The Purpose Tour India stage. MUMBAI: Dozens of reviews and observations have surfaced suggesting the sheer magnanimity and the wonders that resulted at MMRDA Grounds on 19 November. MUMBAI: Near to the end of August, Qyuki and YouTube led music initiative titled Jammin' set rolling, with one video after another, celebrating collaborations between mainstream and digital stars of the music industry.